Positive earnings from the major banks like Bank of America (BAC) and Goldman Sachs (GS) have traders in a modestly positive mood this morning as both stocks are trading higher in the pre-market. BAC has been especially strong, rallying more than 5%. If BAC’s gains hold into the open, it will be the stock’s most positive gap opening in reaction to earnings in seven years and the third strongest going back to 2000! While Goldman is ‘only’ up 3.5%, that would rank as the stocks most positive gap opening in reaction to earnings in over a decade (December 2008). With the S&P 500 clearing the psychologically important 2,600 level yesterday, it’s sort of hard to believe that the index is still below its 50-day moving average. 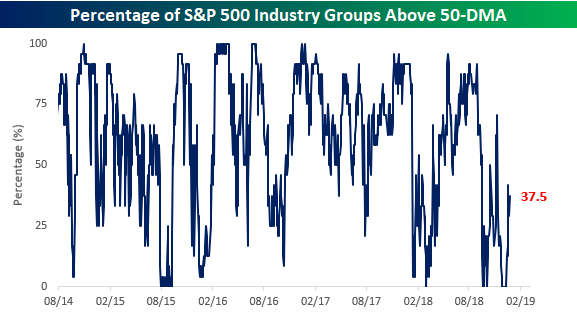 Even more surprising is that of the 24 S&P 500 Industry Groups, barely more than a third (9) are over their respective 50-DMAs. As shown in the chart below, this reading is still severely depressed. Looking on the bright side, though, one more day like yesterday would boost this reading by a lot as through yesterday’s close there were another five Industry Groups trading within 0.50% of their 50-DMAs.